In order to set off the adaptive or Ag-specific immune response T cells and B cells must talk to each other over a shared antigen (Ag). This process is known as “cognate interaction”. It occurs between a B cell and a helper T cell (Th cell). The result is antibody production by B cells and production by Th cells of a variety of soluble factors that support other aspects of the immune response. There are a number of molecular interactions that occur between B cells and Th cells. Each molecular interaction sends a unique signal to the cell. It’s the combination of all the signals, and their strengths, that tells the cell what to do. In this diagram I show only the most-well known and well-studied, and perhaps the most robust, interactions between B cells and Th cells. Binding of Ag by the B cell. (1) The interaction between a T cell and an APC is Step 1 in the activation of a T cell, and can also be one of the main interactions between a B cell and a T cell. B cells can use their surface Ig to grab an antigen. They can then ingest it, digest it, and display bits of the antigen known as peptides, bound to MHC molecules, on their surface. (2),(3). Binding of Ag by the T cell. 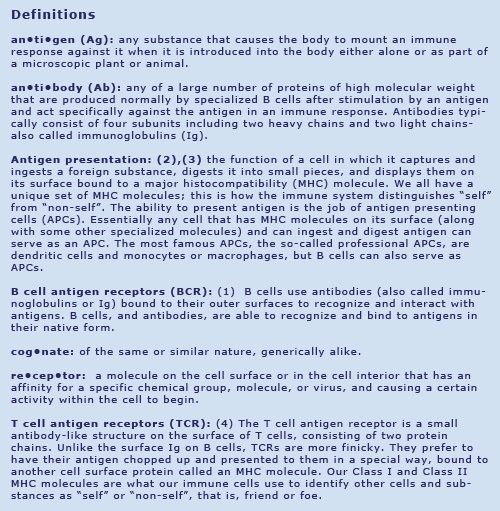 (4) Once this happens, the T cell’s antigen receptor, which is designed to recognize a peptide bound to an MHC molecule, is engaged, initiating the process of T cell activation. CD4-Class II MHC interaction. (5) The CD4 molecule on the T cell then interacts with the class II MHC molecule, but in a different spot on the MHC molecule. 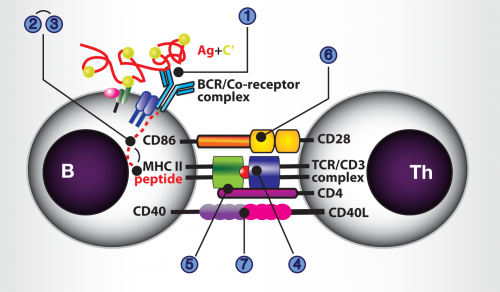 This interaction reinforces the connection between the B cell (or APC) and the T cell, and sends a different go signal to the T cell. Co-stimulation. (6-7) The next interactions we will discuss are known as “co-stimulation”. They are called co-stimulation because they are only productive if the main antigen receptors are also engaged, but activation of the B cell and T cell are only maximized if co-stimulation occurs. Co-stimulation sends unique signals into both cells that augment the first signal provided by the antigen receptors. CD28. (6) There are two main interactions that make up co-stimulation. One is the engagement of the CD28 protein molecule on the surface of the Th cell by its partner on the B cell, a protein called CD86 B7-2. CD40. (7) The other interaction is the engagement of the CD40 molecule on the B cell by its partner on the T cell surface, called CD40 ligand, or CD40L. 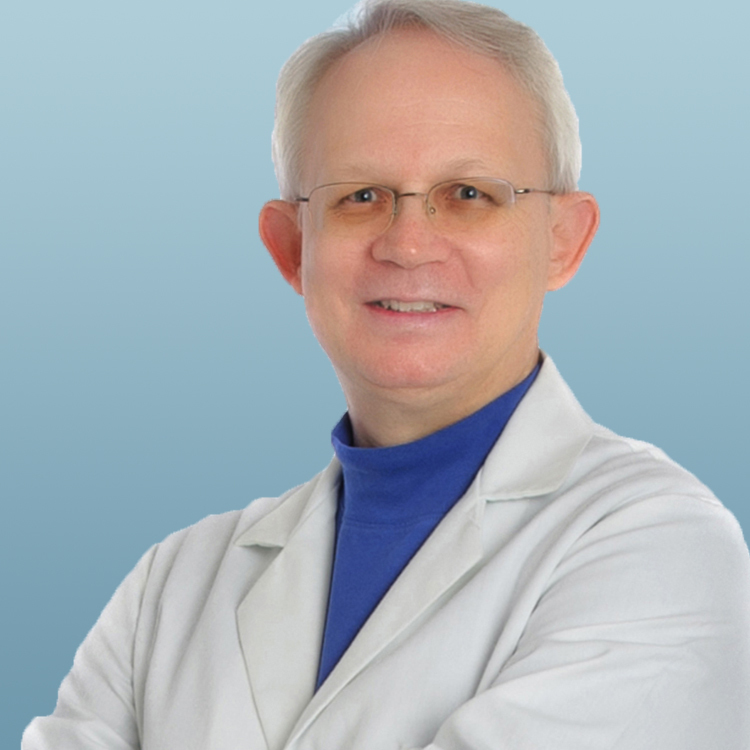 The engagement of all these pairs of molecules, along with several others, on B cells and T cells results in the activation or stimulation of both cells simultaneously. Activation of the cells leads to cell division and formation of many more cells that will respond to the same antigen. This process is known as clonal expansion. Ultimately each B cell will differentiate into a plasma cell, whose only function is to make as many antibody molecules as it can until it dies or gets turned off. Plasma cells are no longer capable of dividing and producing more cells. Activated Th cells produce soluble factors called cytokines which not only promote their own continued expansion, but also the expansion of B cells, and the activation of other types of immune cells.